Rare, small Pink Petalite palmstone with a beautiful deep pink colour. From a metaphysical point of view, the pink variety is the most desirable. It has an exceptionally high vibration and exudes the pure Pink Ray (3rd Ray) of divine love, peace and forgiveness, which is governed by Archangel Chamuel and Ascended Master Lord Serapis Bay. Pink Petalite can assist us when working at a high spiritual level, communing with all Angels, Archangels and Ascended Masters. As a result it is commonly referred to as The Stone of the Angels. A major Ascension Stone! Technical Info: Pink Petalite contains Lithium (which gives it its beautiful colour), Aluminium and Silicon. It takes its name from the Greek word for leaf, ‘petalon’, and can be found in various locations around the world including Afghanistan, Burma, Namibia, Sweden and Brazil. More commonly occurring specimens are colourless, grey and white. 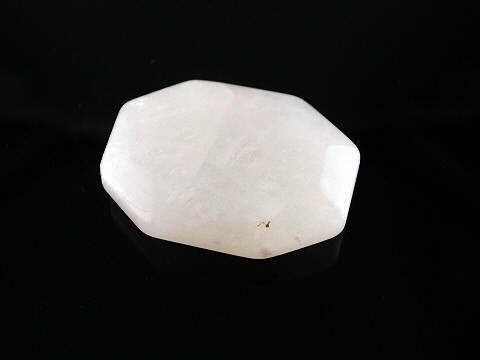 Petalite measures 6-6.5 on Moh’s Scale.